Sumalatha In South - Jayaprada In North! 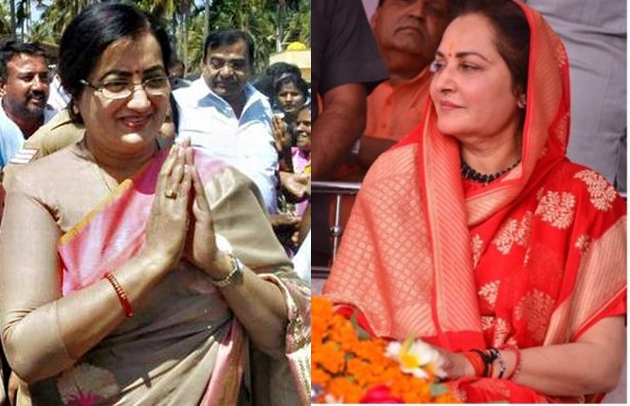 Senior Actresses Sumalatha and Jayaprada have been testing their luck in the upcoming Lok Sabha Polls. While Sumalatha is contesting as Independent from Mandya constituency in Karnataka, Jayaprada preferred contesting on BJP Ticket from Rampur which was represented by her for two terms in the past. These Glam Dolls of the 80s have been drawing the attention of people across the nation now. Both Sumalatha and Jayaprada had many things in common. They both forayed into Film Industry in the year 1979. 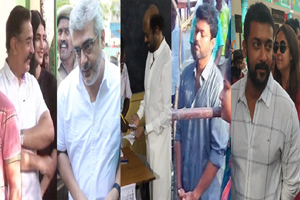 Their age is one and the same (55). Both of them had done films in multiple languages, known for their beauty, acting calibre and dignified behaviour. Jayaprada was born in Rajahmundry on April 3rd, 1962. Lalitha Rani was her original name. Her Parents (Krishna Rao, Neelaveni) encouraged her to gain expertise in dance from childhood. That talent fetched her film offer from K Balachander at the age of 13 and received a remuneration of Rs 10. She acted in Telugu, Tamil, Hindi, Kannada, Malayalam, Bengali, Bengali and Marathi Films. Jayaprada's political career began with TDP. Later, She joined SP and became an MP. Sumalatha was born in AP on August 27th in the year 1963. She was crowned Miss Andhra in 1979 and became popular at the age of 15. D Ramanaidu casted her in few films and she never looked back thereafter. Sumalatha received Rs 1001 as her first remuneration and went on to act in 220 films. After the demise of her husband Ambareesh, She took a plunge into politics and fighting against Congress-JD (S) candidate Nikhil Gowda in Mandya. What PK Said About Chiru's Political Plans? Is That An Indication Of TDP-JSP Alliance?